On the Islamic Republic TV channels, including Press TV, Peter Rushton is introduced to the viewers as a Historian and a Political Analyst. Yeah right! So, who exactly is this weirdo? He claims to have a degree from Oxford university, but people I have spoken to, who were with him at Oxford, say he was a university drop out, who was kicked out and never finished his degree. While at Oxford, he did not show any Nazi tendencies, and was more into conspiracy theories, until he joined the BNP in the 90s. In November 2000, he travelled to Spain to celebrate the birth of the Fascist dictator, General Franco. 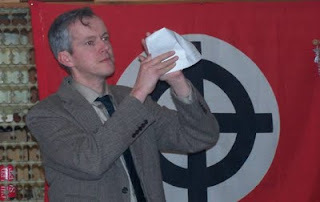 Rushton remained a die hard member of the BNP until 2002 until he was expelled from the party for various accusations made against him, including that he was gay because of his effeminate behaviour. After getting kicked out of BNP, Rushton joined a more extreme Nazi group, called the White Nationalist Party. 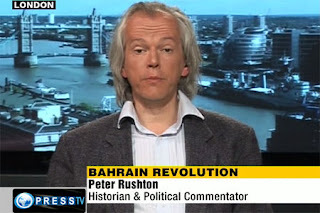 This regular guest on Press TV and other IRI state TVs, is now in the England First Party and is the associate editor of its magazine, Heritage and Destiny. He is also the webmaster for the website of the notorious holocaust denier, (Lady) Michele Renouf, who is also another regular star of the Islamic Republic media. So, Press TV continues to gravitate all kinds of weirdos like Lauren Booth and Galloway as well as White Supremacists like Peter Rushton and broadcast all kinds of inflammatory programs and OFCOM is ok with it. Amazing how at 'times of austerity’, some useful services are cut back and useless bodies continue to survive. When it comes to PressTV, it's not guided by any sort of divine God rather by detestable Ego's who bear a grudge! As proven with the recent Murdoch scandal there are now many British institutions eithr knobbled or not up to the job. And when Britain also allows a State run blatantly bias IRI machine like PressTV to operate, then obviously OFCOM needs to be replaced by a body of higher ethics and princibles. Special interest black ecomony money or coming up with PC red tape and double talk shouldn't be allowed to undermine democracy. And both Murdoch and the likes of PresTV do just that! So time for the corrupted big white elephant of OFCOM to go! That BNP platform and his tie reminded me of Nazi's stuff.